A few days ago I did a list of the 5 funniest football club names and one of those names was FL Fart. They are a Norwegian club, not very popular but without a doubt one of the funniest club names that you will ever come across. 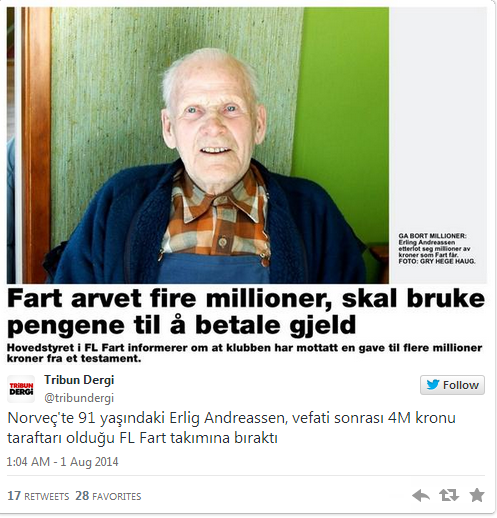 FL Fart has hit the jackpot, Erling Andreassen passed away at the age of 91 and he left all of his fortune to his beloved team, an estimated £377,000. I am sure his family is not happy with this elderly man leaving all of his money and belongings to a football team, but what can they do, you can’t judge someone’s passions and desires. 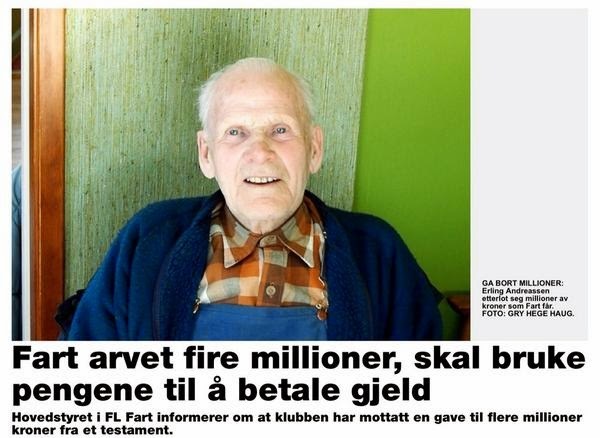 The team was as surprised by this occurrence as his family members, when they learned that Erling had decreed the sale of his estate and all money made from the sale to go to the team. FL Fart are a fairly good Norwegian side, they played in the Toppserien, Norwegian first division, from 2008 to 2012. The team should name a stand in their stadium after this fan; it isn’t every day that someone decides to leave all of their worldly possessions to a football team. Either he was a huge fan of the team or really hated his family, either way he went completely outside the box on this one.